This job entailed the fabrication and installation of lead shielding materials for a PET/CT Scanner, three uptake/injection rooms, one hot toilet and one hot lab. The materials used for this project included interlocking lead bricks, lead lined plywood, lead lined sheetrock, lead lined doors and door frames, leaded glass and a lead lined view window frame and miscellaneous sheet lead to shield seams and penetrations. 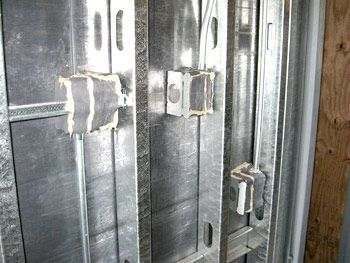 The images below show portions of the installation process and how continuous shielding is achieved. 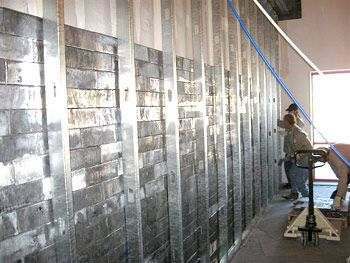 The image above shows our interlocking lead bricks being installed between an existing wall and a row of steel studs. This is a preferred method of installation since it allows for easy runs of low and high voltage wiring for receptacles, light switches, phone jacks, and other elements without worry of penetrating the lead. It is also a good means of supporting the weight of the lead. The picture above shows layers of 1/16" thick lead to shield the penetrations made in the lead lined plywood for receptacles, light switches, and more. Layers of 1/16" thick lead are used to achieve shielding equal to 1/4" lead or 3/8" thick lead because lead at 1/16" thick is very malleable and easy to wrap versus the 1/4" thick lead or the 3/8" thick lead that is laminated to the plywood. To learn more about Radiation Protection Products contact us or request a quote for lead bricks or other lead products for your project today!